Oxford Public International Law (OPIL) is a comprehensive, single location providing integrated access across our international law services, bringing you one step closer to the perfect research solution. Oxford Reports on International Law, the Max Planck Encyclopedia of Public International Law and Oxford Scholarly Authorities on International Law are ground-breaking online resources working to speed up research and provide easy access to authoritative content, essential for anyone working in international law. To mark Human Rights Day, we have produced a map of 50 landmark human rights cases, each with a brief description and a link to a free article or report on the case. 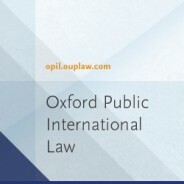 The cases were chosen in conjunction with the editors of the Oxford Reports on International Law. These choices were intended to showcase the variety of international, regional, and national mechanisms and fora for adjudicating human rights claims, and the range of rights that have been recognized. The following map provides a quick tour to these cases, highlighting trends and themes, some positive, some negative. A lot of these cases are important because of the way they demonstrate the possibility of righting historic injustices: for the disappeared of Honduras, for victims of Argentina’s “dirty war,” for Hitler’s slaves, heroes of the Chernobyl disaster, and East Germans gunned down trying to reach the West. They also shine a light on what happens in the aftermath of war: Peruvian politicians attempting to pass amnesty laws to prevent accountability, people on the losing side of World War II having their property stolen, and the operation of post-World War I minorities treaties. From a human rights standpoint we probably have a number of preconceptions about Africa – large scale atrocities and impunity. While that is horribly true in places there are also aspects of the cases highlighted in our map that might surprise some. The one case about an investor’s rights (Diallo) features an African state, not one of the typical capital exporting states, taking legal action on behalf of its citizen. There is also the range of fora in Africa that offer remedies. In addition to the obvious forum – the Commission and Court of the African regional human rights system, we have cases from the East-African Court of Justice and the ECOWAS Community Court both finding that they are empowered to adjudicate on human rights issues as universal as the rights of indigenous peoples and anti-slavery. Whereas you wouldn’t be surprised to see a post-Apartheid decision from the South African domestic courts in this list, it is instructive to see a case from Ugandan domestic courts on press freedom. The modern proliferation of rights is often a topic of humorous exaggeration. These cases exemplify a great breadth of rights beyond the classic civil and political rights of freedom from torture, or free speech. Where it does address these topics there is a novel twist: on torture, whether it is OK to extradite criminals to a place where they face torture; on free speech, whether Holocaust denial should be protected. Several have gender aspects: states’ obligations to prevent domestic violence, women being required to prove they are the “breadwinner” in order to have access to unemployment benefits, sexual violence against women as a means to silence political dissent. Others bring in group rights: self-determination, rights of indigenous peoples, and even the rights of tribes imported via the slave trade. Add to these cases on the execution of minors, anti-homosexuality laws, and treating a person’s DNA as their private matter, and we see how far the law has developed. Opponents of human rights litigation often point out that these rights are frequently claimed by people whom we deplore. It is true that many of the people making claims in these cases were accused of murder and terrorism, or at least were sworn enemies of the state that (allegedly) abused them. So the lesson here is that these are human rights, not “nice people’s” rights. With so many human rights remedies available there is a temptation for litigants, whether states or individuals, to use human rights as a way to get an issue before a court. You would expect the case between Georgia and the Russian Federation at the International Court of Justice (ICJ) to be about the illegal use of force by Russia. Instead, Georgia sued under a human rights treaty: the International Convention on the Elimination of All Forms of Racial Discrimination (CERD). Why? Ordinarily Russia could refuse to submit to a legal procedure at the ICJ, but the CERD contains a provision saying that in any dispute under that treaty between two states that have ratified it (which Russia and Georgia had) both parties must agree to the jurisdiction of the ICJ. So Georgia gets minor revenge for Russia’s invasion and annexation by suing Russia for racial discrimination. You might think the clustering of pins in our map is about abuses, but actually it demonstrates access to a legal process (and, depending on implementation) a remedy. So plenty of pins in Europe, and Israel, but none in Saudi Arabia or North Korea. These 50 cases are by no measurable sense the 50 greatest or most important cases, but they do amply demonstrate the expansion and increasing profile of this, mostly admirable, element of the rule of law. John Louth is Editor-in-Chief of Academic Law Books, Journals, and Online at Oxford University Press.